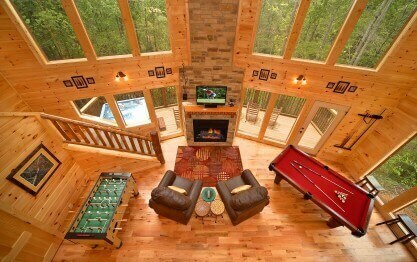 The log cabin is a true American icon. It evokes a certain nostalgia of simpler days of yore and represents the essence of rugged individualism that shaped our country. These rustic wood structures seem to tell stories of the self-made man proclaiming his ability to combat and survive the harsh elements of the wild. In Southern Appalachia, log cabins helped to provide everything a pioneer needed: a sturdy shelter from the elements and a simple, self-sufficient lifestyle. Historic log cabins and modern cabins today speak to this folklife and folklore of American frontier life. 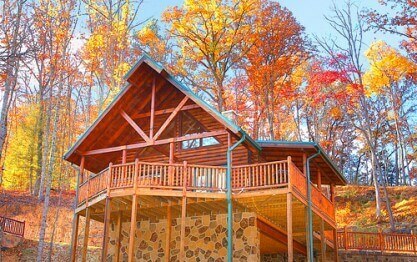 So whether hiking to a remote historic cabin in the woods or renting a modern vacation cabin, often the goal is the same. 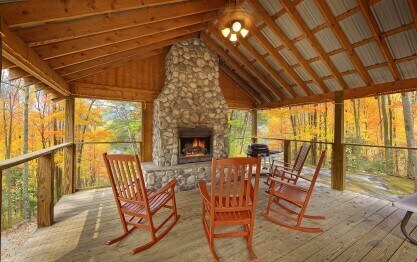 People are usually seeking solitude and simple living, happy to escape the clamor and buzz of busy contemporary life. Log cabins did not die out with the pioneer era, in fact the mystique was cemented in the American psyche and guests and visitors to the Great Smoky Mountains National Park region can continue to be a part of this pioneer tradition by learning about and experiencing the log cabin life. 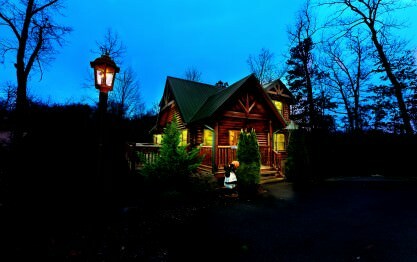 The exact origin of the log cabin is not certain, however it is likely that people began constructing them as long ago as the Bronze Age (c. 3,500 B.C.). Northern Europe, Scandinavia, and Russia have long been known to use logs to construct houses, barns and other outdoor buildings as these regions had large quantities of softwood timber that could be manipulated with simple hand tools. Thus, immigrants from these northern European countries brought their knowledge of log building construction with them to the new world. When they first settled in the colonies and lands now a part of New Jersey, Delaware, Pennsylvania and Maryland, they used this background knowledge, along with a plentiful forest supply, to build log cabin homes. 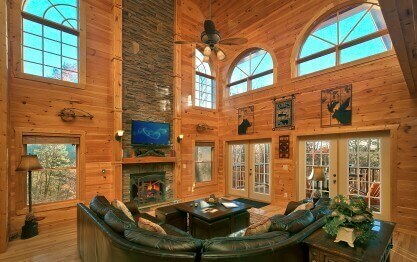 Many historic log buildings exist, but they would not necessarily be considered a log cabin. A log building is defined as a building whose structural walls are composed of horizontally laid or vertically positioned logs. While many homes in the 18th and 19th century would have been considered “Log Houses,” a “Log Cabin” sets itself apart from a “Log House” in several distinct ways. These two structures can be distinguished by certain features. 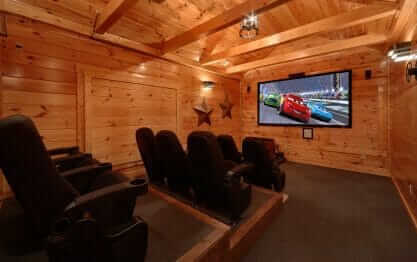 For example, A “Log Cabin” was a simple one, or one and half story home, more impermanent in nature and less finished, usually constructed with round logs and a single “pen” room. 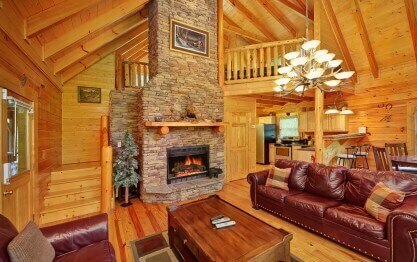 A “Log Home” was more sophisticated and permanent, with smooth hewn logs, with one or two stories and more complex design. The process for building a cabin was relatively simple. Builders must first cut down trees and then trim them. Then they would need to drag them to the building site, build a foundation, stack and notch log, daub and chink them, and usually construct a chimney and fireplace. Early log cabins did not have glass windows like other log or framed homes of similar time period. If windows were cut at all into the cabin they would be covered with animal skins or boards. The fireplace was usually constructed at the end of the cabin and made of wattle with stone or clay used for hearth or interior. The fireplaces were vital to frontier life as they provided light, heat source and a place to cook food. Floors were usually packed dirt. Early settlers had to use the resources they had available to them. As 18th and 19th century early American lands were replete with forests, trees of all varieties were abundant. Thus early settlers had many options when it came to the wood they might use. Wood selection was quite important because of the certain types of wood that were better for construction and durability. Many early cabins were built of chestnut, white oak, cedar, fir and pine. These types of trees were preferable because they were long and straight, and they were also rot resistant. Wood that was resistant to the elements was very important for settlers on the frontier. Another reason cabins were among some of the first dwellings and could be constructed and raised rather quickly is they only required a few simple tools, and of course a lot of manpower, for construction. 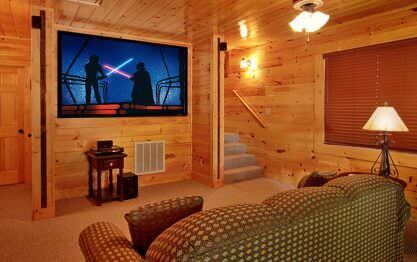 The typical tools used to build a log cabin were a felling axe, a broad axe, and a hand saw or crosscut saw. A felling axe, the most important, was a traditional tool used to bring the trees down. 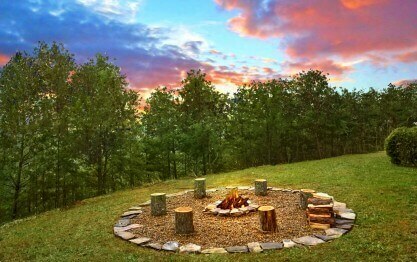 Then trees might be debarked or not and used in their original round form. Usually one of the sides of the log was cut with a flat broad-axe and finished off with adze to smooth thick planks. The foundation of a cabin was very important but had to be constructed of local and accessible materials. Depending on how quickly the cabin must be erected, planned stay of permanence and access to materials, different resources were used to lay a foundation. Many log cabin foundations were made with flat stones, brick, or short vertical log pilings or “sleepers” set on a grade. Cabins that were less likely to serve as permanent dwellings would have been more likely to use a log “pilings” or “sleepers” as a foundation whereas tones and brick would have been laid for structures more likely to be used for a longer period of time. 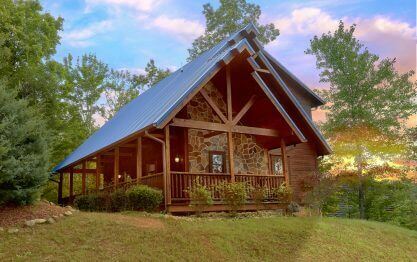 While the most basic and well known cabin design consists of a single pen with an exterior chimney, there were several cabin designs that existed and often came to fruition as families expanded. The most basic log cabin unit was a one room enclosure with four log walls, joined at the corner a front door and an exterior chimney on one end. The single pen cabin could be expanded by constructing an addition of another log “pen” or creating an interior partition. Corner Notching was an essential part of log building construction as it provided structural integrity by locking log ends into place at the corners of the cabin. Different styles of notching methods gave the cabin pen varying levels of rigidity and stability. Numerous types of notching methods and techniques were used in cabin construction across the United States. After logs were joined the horizontal spaces between logs had to be filled with a material known as “chinking” or “daubing.” Chinking and Daubing was the final step in the completion of the exterior walls of the log cabin pen and sealed them against weather elements. The chinking and daubing part of early log cabins was the most likely to have to be repaired and patched is it was most likely to wear from weather elements, structural settlement and thermal expansion. First, a dry bulky blocking such as wood or stone had to be inserted into the joints. Then a soft packing filler material such as moss, clay or dry animal dung was filled in and smoothed over. Finally, the daubing process was the final step when a layer, usually consisting of clay and lime or other local materials, sealed everything off. Log cabin roofs varied with region and resources. 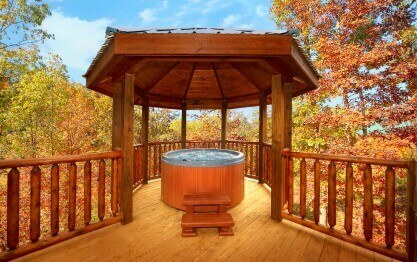 However, the first rustic cabins usually used wood shingles. Later cabins would use seam metals roofs, roll roofing and in some places out west, sod. Log Cabin Chimneys were usually constructed of stone or brick and sometimes even clay-covered, logs. Cabins constructed in the the northern United States usually had all interior chimneys to promote heat retention whereas many down south were built with chimneys on the outside of the log walls. 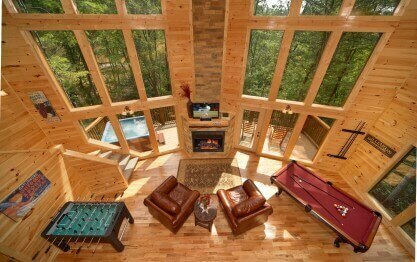 The interior of log cabins depend on the skill and time of the builder. Quickly constructed cabins often featured, exposed roughly hewn logs on the inside. Only more permanent cabins would have smoothed and finished interior logs. Some even had covered interior walls with plaster or boards pasted with newspaper of fabric, these type of walls help promote retention of heat and further insulate the cabin against weather elements. 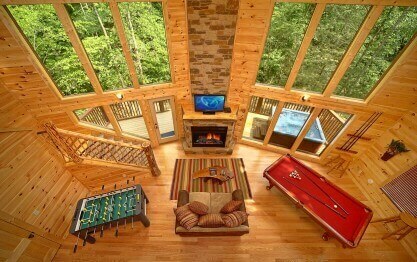 Popular in the United States for the past 200 years, the “Log Cabin Quilt” design will never go out of style. This design that begins with a center block or shape is created with strips sewn in sequence around the center object, like logs. However, just as we assume that the log cabin is solely an American icon, upon investigation these structures were footed in Europe and the same goes for the Log Cabin Quilt Design. Similar patterns can have been found in Great Britain that date design pre-dates the 1800s and even on ancient Egyptian mummies. This quilt design continues to remain popular today as it evokes that feeling frontier spirit and serves as a folklore symbol of American values. 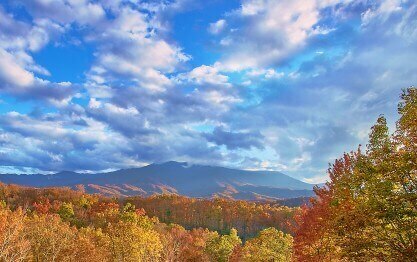 The Great Smoky Mountains National Park is an embodiment of the pioneer spirit. One of the first frontiers, long before Westward expansion. The lands now encompassed by the park hold remnants of the first white settlements in Appalachia. 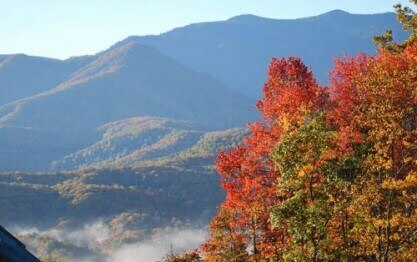 Today the Great Smoky Mountains National Park has one of the best collections of historic structures in the eastern United States. With over ninety historic structures that includes many at least twenty log cabins. 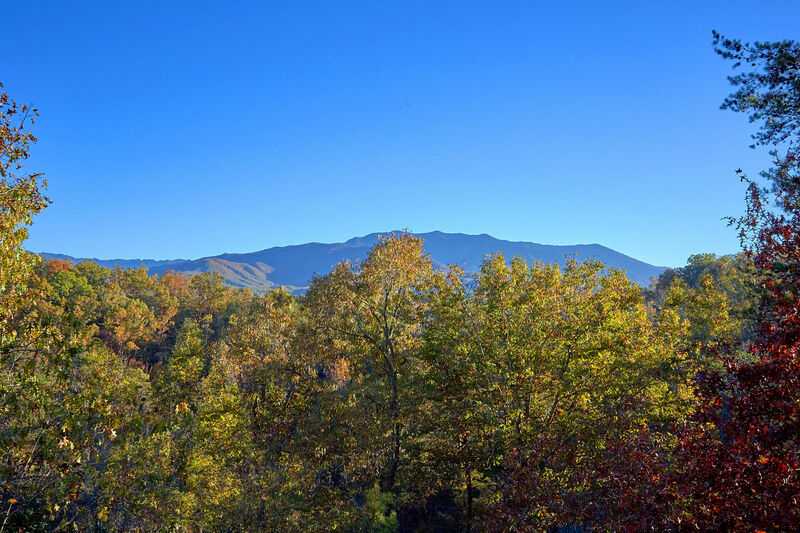 These historic structures can be visited in different parts of the park with the best examples located in Cades Cove, Cataloochee, Oconaluftee, and along the Roaring Fork Motor Nature Trail. 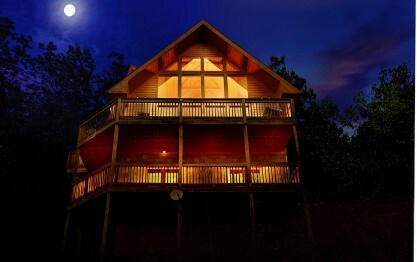 The oldest known cabin in the Gatlinburg area is the famous “Ogle Cabin” Martha Jane Ogle the first known settler in the Gatlinburg area moved to the “Land of Paradise,” with her two children and a few other family members, her brother, Peter Huskey, along with her daughter, Rebecca and her husband, James McCarter. It was here in 1807 that they built the first cabin in the area in homage to her dead husband who had purchased the land. The Ogle Cabin can still be visited today. Formerly located next to the Arrowmont School of Arts & Crafts, the Ogle Cabin has now been moved to become apart of the Gatlinburg Welcome Center. This cabin is now listed on the National Park Service’s National Register of Historic Places. 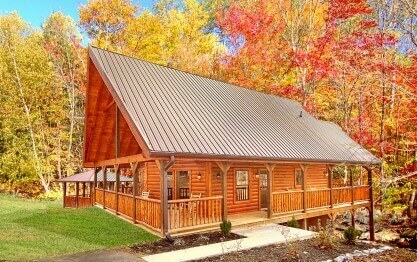 This first cabin was built in the town of White Oak Flats that would eventually become the town known as the town Gatlinburg. Many more would follow in Ogle’s footsteps to become the first settlers of the Smoky Mountain Region and build log cabins of their own. Located a half mile off of Cades Cove Loop, the Elijah Oliver Cabin and homestead is a must see on your Smoky Mountain Vacation. This cabin homestead was home to Elijah Oliver, who was a Smoky Mountain native born to John and Lucretia Oliver in Cades Cove in 2824. 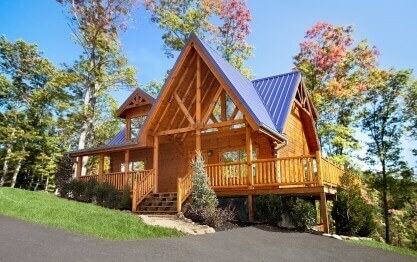 This cabin was constructed in the “Dog-Trot” style and built on a stone foundation. A separate freestanding kitchen building (actually former cabin home itself) was later attached. This cabin site is a fantastic representation of a true Appalachian Homestead where these first pioneers had to be completely self-sufficient. In addition to the main cabin this site includes a smokehouse, springhouse, corn crib and chicken coop. Home to the first white settlers in Cades Cove, the John Oliver Cabin is the oldest standing structure in the Great Smoky Mountains National Park. Built in 1822 the land where the cabin stands today wasn’t actually purchased by John Oliver until 1826. 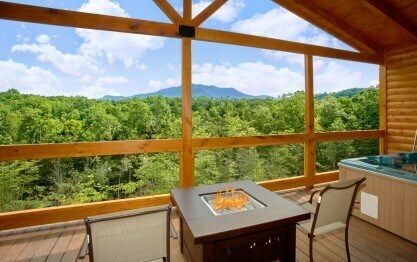 This cabin can be accessed via a parking lot at the beginning of Cades Cove Loop. 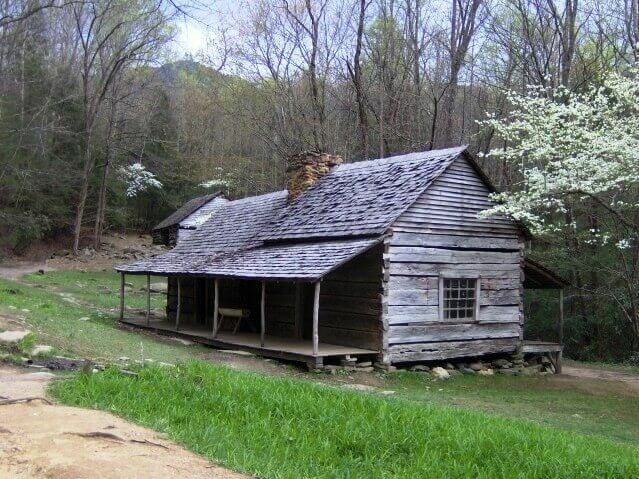 This cabin built in 1856 was one of the first cabins in Cades Cove to feature a brick chimney. The bricks used to make the Chimney would have been handmade using local resources in the valley. the bricks were handmade with local clay, dried, and fired to finish them. Like many settlers the Lawsons made improvements to their home over time replacing cabin logs with sawed lumber and added a second story and porch. Used at times as a post office, the Dan Lawson Cabin and homestead also features a smokehouse, granary and corn crib. Constructed in 1898 by widower Henry Whitehead for his new wife, Matilda Shields Gregory, this cabin is one of the nicer cabins in Cades Cove. (Matlida Shields was actually divorced by her first husband-a real rarity at the time). 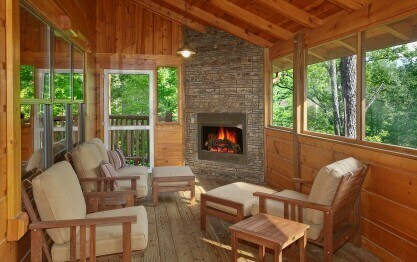 This cabin features one the few brick chimneys in Cades Cove. Also, unlike simpler more, rustic cabins this cabin was constructed with square logs, which provided better insulation, and the interior log sides were smoothed and finished unlike the rough hewn logs in more primitive cabins. 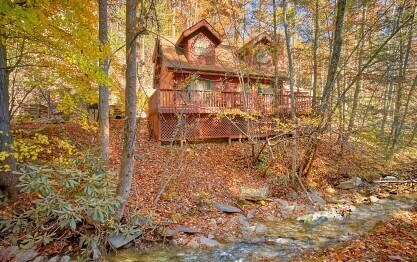 A well kept secret, this cabin is a true gem. 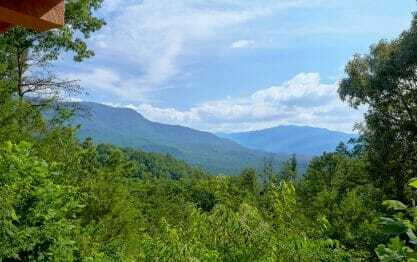 The Mayna Avent Cabin is short hike from the Jakes Creek Trailhead junction accessed just before Elkmont campground in the Great Smoky Mountains National Park. This is a cabin not frequented by many visitors to the park because it is not well marked, in fact there is no sign. 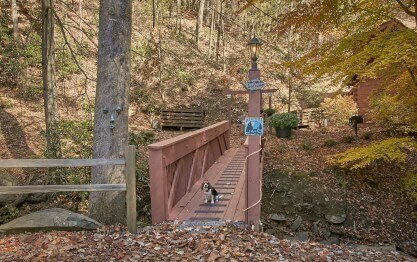 Hikers must look for wooden steps leading down from Jakes Creek Trail toward the creek. 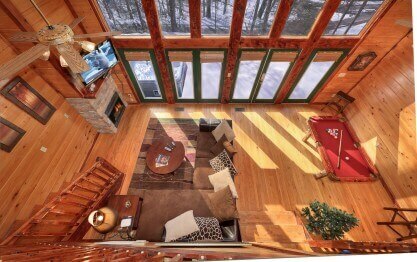 Originally built in 1950, this cabin has served many purposes. The Avent family purchased the cabin in 1918. 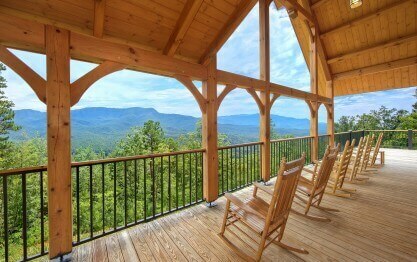 Mayna Treanor Avent, a famous Tennessee artist, decided to convert the cabin into her summer art studio. The original cabin had no windows, as many primitive cabins did not. However, Mayna’s son Jim added windows in the mid 1920s to better serve its purpose as an art studio. Mayna continued to use the cabin as her art studio through the 1940s, even after the National Park purchased the cabin in 1932. 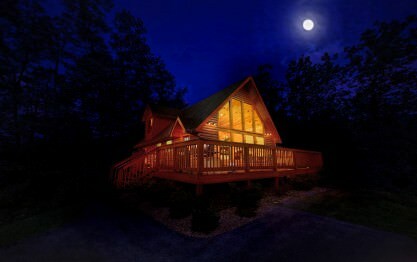 Even after this purchase the Avent family was given a lifetime lease on the cabin and continued to use it until 1992. Today the cabin’s only use is to serve as a living history and jewel for curious hiker. There is a guest sign-book for those who stop by. This Cataloochee Cabin was built in 1864 by John Jackson Hannah.The son of an original Cataloochee Valley pioneer Evan Hannah. At one time this cabin sat in the middle of working apple orchard, garden, other buildings, and fields surround it.6. The cabin was handed down to his son Jim upon his death. Jim Hannah was a jack-of-all trades and worked as a farmer, bee keeper, sawyer, and justice of the peace. 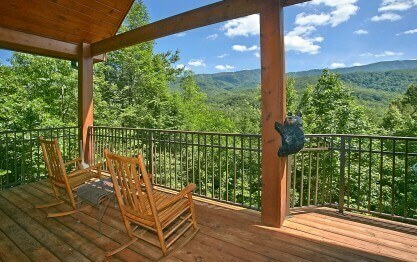 Jim stayed in there until the cabin and land was purchased to create the Great Smoky Mountains National Park in the 1930s. 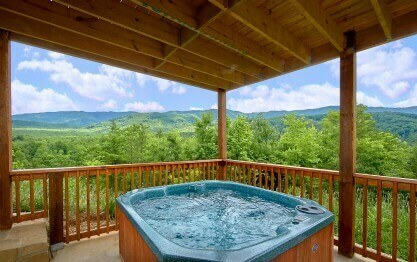 This cabin can be accessed via the Little Cataloochee Trail. 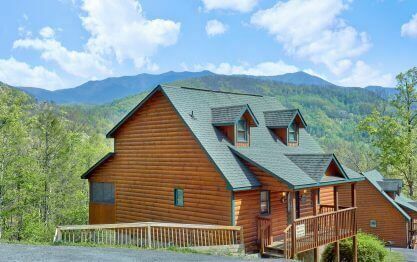 One of the easier cabins to access in the Great Smoky Mountains National Park, the Bud Ogle Cabin is located just off Roaring Fork Nature Trail on Airport Road. This historic cabin was constructed by Noah “Bud” Ogle was built in the late 1800s. The cabin that stands today is an excellent example of a“Saddle-Bag” style which includes two separate square cabin pens that share a chimney. Both cabin pens are eighteen by twenty feet and demonstrate how many pioneer families might add-on a cabin pen to accommodate a growing family. This cabin also features a very unique feature for it’s time, running water. A wooden plume was constructed from a nearby stream and ran up to the back porch where it poured into a double sink made from a large log. This was an incredible amenity and luxury for its time. In 1977 The Bud Ogle Cabin and Homestead (which also includes a barn and tubmill) became listed on the National Register of Historic Places. Noah and his family tended and apple orchard here and grew corn. 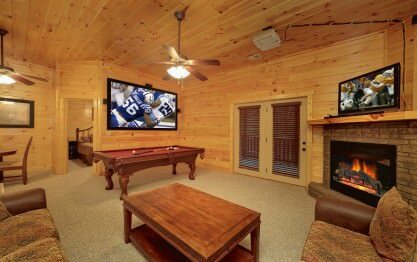 Durant already understood the log cabin appeal and its representation of the simple life. 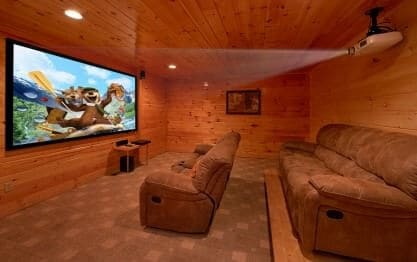 He preyed on this idea and encouraged urban dwellers to escape the cramped and stuffy city life and relax in his vacation cabins to better appreciate the natural world. 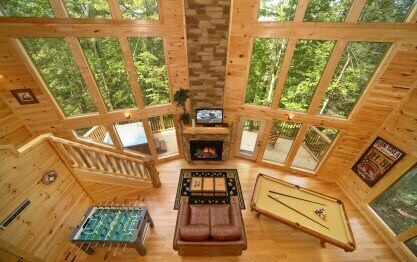 In 1876 he began constructing cabin camps in the Adirondacks for the wealthy to retreat the heat of summer in the city. Durant constructed a group of simple cabins at Raquette Lake, these would later become Camp Pine Knot. These were originally built to entertain wealthy railroad investors and politicians. Durant went on to build another camp complex at Shedd Lake called Sagamore. 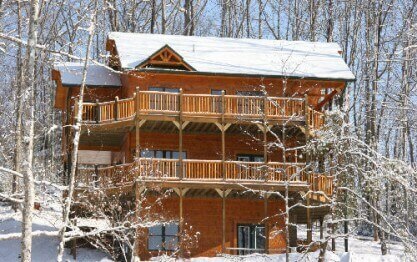 This camp included a huge three story main lodge. While Durant had to sell Sagamore, the idea caught on and many of his camps would serve as a models for other retreat camps and lodges across the country. While these first cabins were designed in the nostalgic vision of a pioneer cabins, they were far from simple. 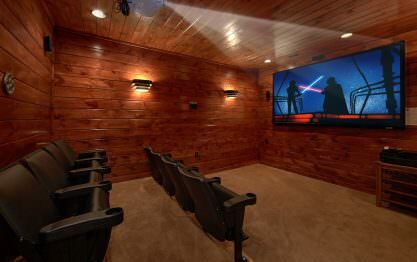 Many were designed by architects with large rooms and modern were hardly simple. Designed by architects, they were huge structures with many rooms and fireplaces and porches. 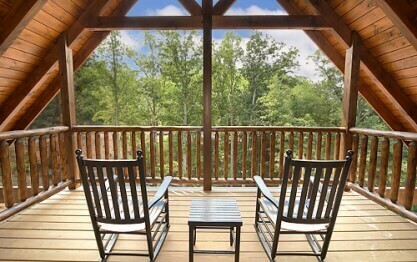 This revival of Americans love for cabin and lodge life can be seen in the incredible architecture of many national park historic lodges and cabins. National park historic log lodges convey this renaissance especially in the construction of such famous historic lodges like The Old Faithful Inn in Yellowstone National Park. 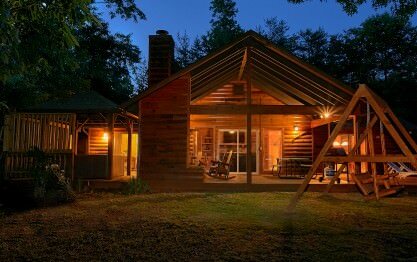 The Great Depression of the 1930s actually played a significant role in keeping cabin construction alive. During its heyday, the Civilian Conservation Corp worked on many partnerships with the National Parks Service and the US Forest service to build thousands of log cabins and log structures throughout national parks and national forests across the country. Many of these log buildings can still be visited today. 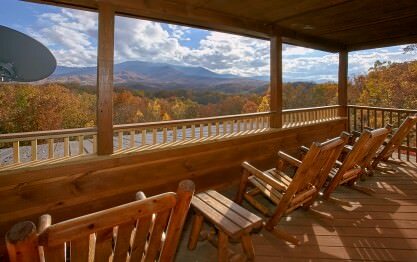 Today the “log cabin” tradition is something visitors to the Great Smoky Mountains can have, though it’s quite different from the rustic cabin experience of early settlers. 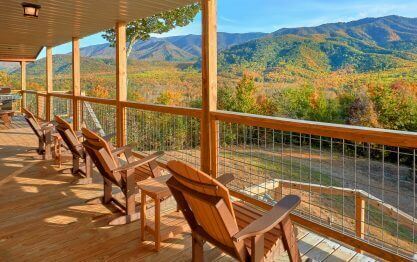 The Gatlinburg/Pigeon Forge/Sevierville and Great Smoky Mountains region is one of the top tourist destinations in the country. 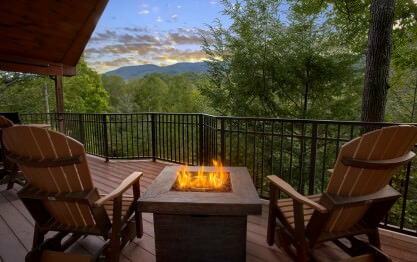 While this area was once rural mountains and valleys, it is now a bustling hub of tourism, many visitors seeking that “Authentic Appalachian” experience. 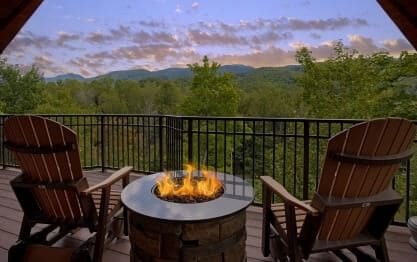 Gatlinburg alone attracts more than eleven million visitors each year and the town of Gatlinburg boasting 3,944 permanent residents, however the tourist population can explode to over 40,000 on a given night. 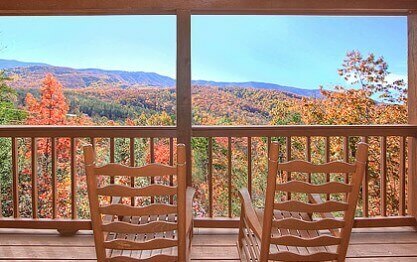 A mecca for log cabin rentals today, the Great Smoky Mountain region has over 15,000 cabin rentals throughout Gatlinburg, Pigeon Forge, & Sevierville, Tennessee. 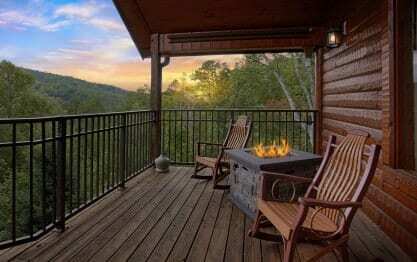 While the vacation rental cabins now are far more luxurious than the cabins built over 100 years ago in Eastern Tennessee, they still pay homage to the pioneer spirit and traditions of this remarkable Appalachian region. 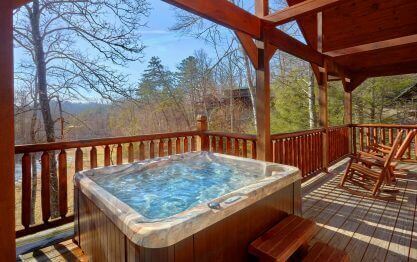 While many cabin resorts have been developed in the Gatlinburg, Pigeon Forge, & Sevierville area over the past twenty years, none compare to the exclusive Elk Springs Resort. 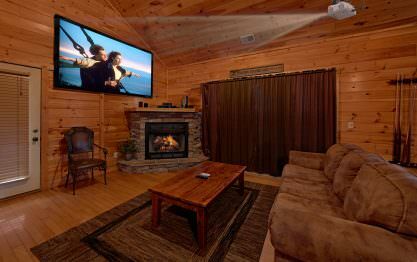 This cabin resort truly sets the standard for luxury and quality in the area. 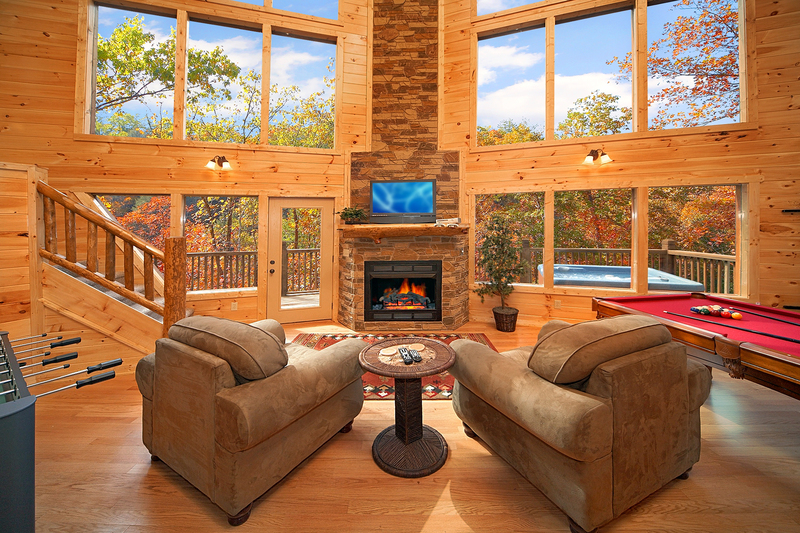 From the selection of the land to the last detail in each cabin, the vision for the development and construction of every cabin at Elk Springs Resort is an endeavor to create a one-of-a-kind luxury cabin experience that no other cabin rental business in the area can rival. 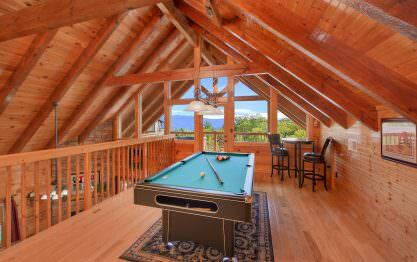 Part of this authentic feel has to do with the location of Elk Springs Resort. 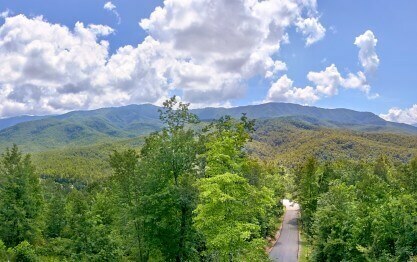 While it is situated within 8 minutes from downtown Gatlinburg and only 15-20 minutes to the big attractions such as Dollywood in Pigeon Forge, it is also ideally nestled in the mountains just down the road from Gatlinburg Arts & Crafts Community. The historic arts and crafts area has been designated a Tennessee Heritage Arts & Crafts Trail. Founded in 1937 by a group of area craftsman seeking to be closer to their places of creation amidst their tools and resources while fleeing the downtown area and it’s attractions. Thus, the resort located just minutes away benefits from this local and legendary community and its incredible contribution to the area. 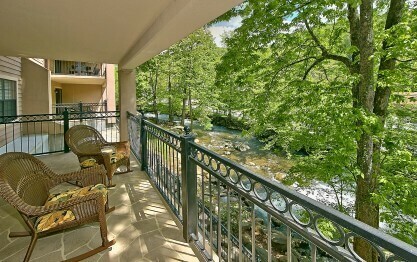 So many people come to Gatlinburg to experience the initial draw of the area, the beauty coupled with the artisan feel. 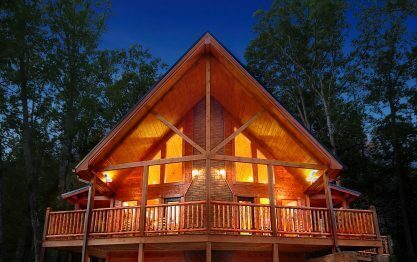 Elk Springs Resorts latest cabins represent their evolution and commitment to cutting edge construction and luxury accommodations. 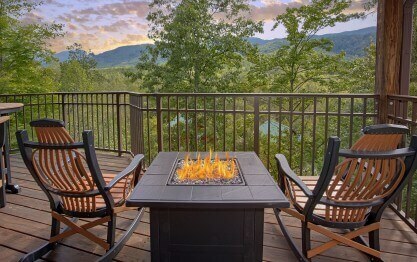 Urban Cowboy, one of Elk Springs Resorts newer construction offers a modern twist on country life with a magnificent mountain view. The name says it all, as this cabin features innovative design and architecture and serves as the premiere honeymoon cabin at the resort. 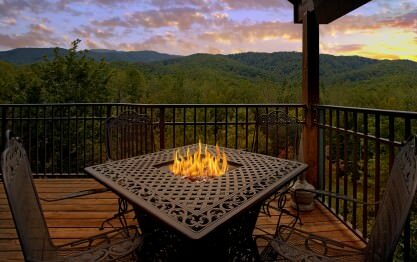 Urban Cowboy features a luxurious enclosed infinity pool with floor to ceiling windows that peer out over the mystical Great Smoky Mountains. 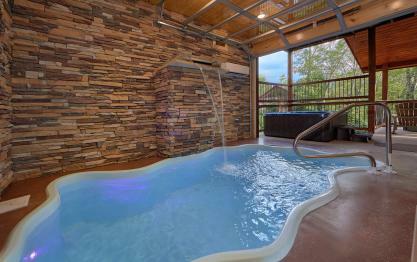 This honeymoon hideaway also has its own personal spa. The luxury master suite features a pass through fireplace, jetted vessel tub with ceiling fill feature, and a rustic spa rain shower with pebble floors, stone surround and body massage jets. 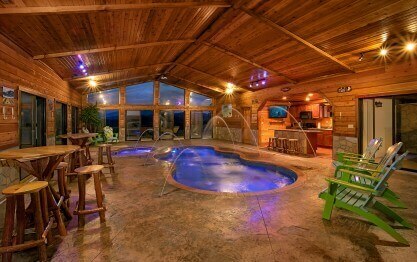 Other examples of luxury design meets family fun includes cabins like Skinny Dippin. 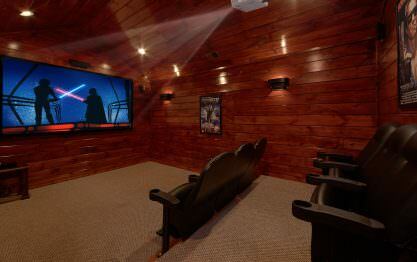 This cabin features a 3,500 gallon pool in an exclusive private pool room with a 9 foot screen theater overlooking it. 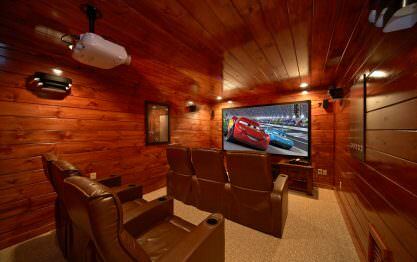 This cabin was specifically designed to maximize fun and leisure. 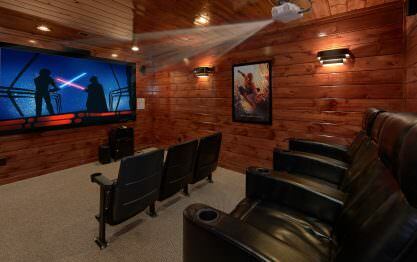 Guests can enjoy their favorite movie as they float or splash right in front of the big screen. 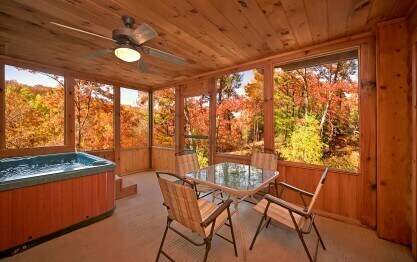 This cabin also includes an outdoor fire pit, huge hot tub, and rocking chairs to relax in on the covered back deck. 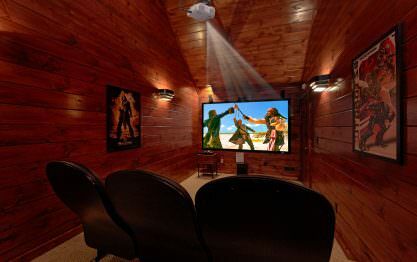 Mountain View Mansion, is a great example of remodeled lodge designed and created to take luxury accommodations to the next level. 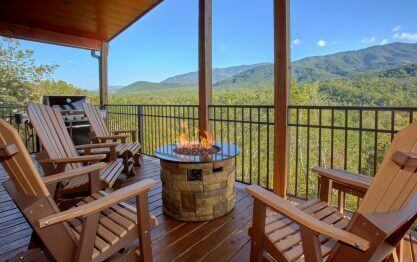 This mammoth lodge sleeps eighteen guests with six bedrooms and seven and half baths. 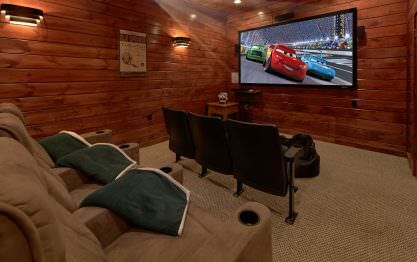 In addition to massive patios overlooking remarkable mountain vistas, and its own private basketball court, this home has an attached recreation building with its own pool, Jacuzzi, theater screen, and bar. 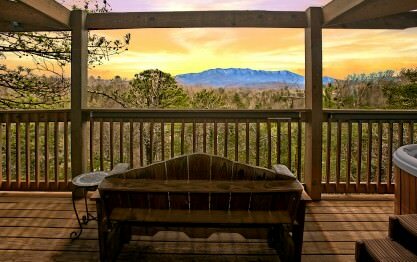 A truly unforgettable getaway, Mountain View Mansion is a great way to escape and bask in the beauty of the surrounding mountains. 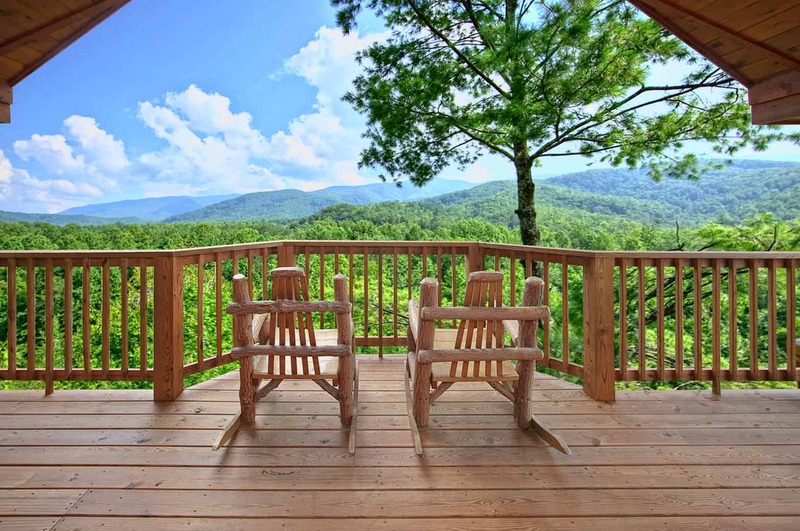 A “View to Remember” is also a newer cabin designed and constructed to maximize mountain views, maintain seclusion and attain the next level in luxury amenities. 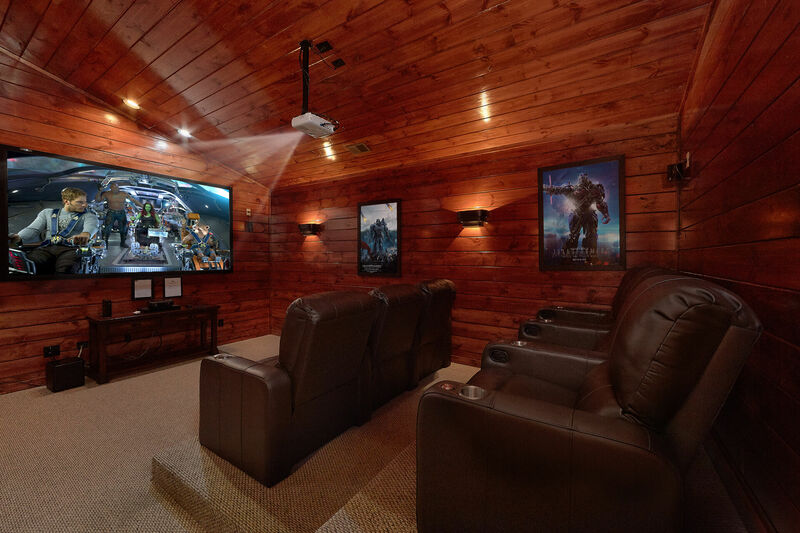 The large open floor plan in this cabin features a twenty-eight foot ceiling and walls of glass that provide incredible views and lots of light. 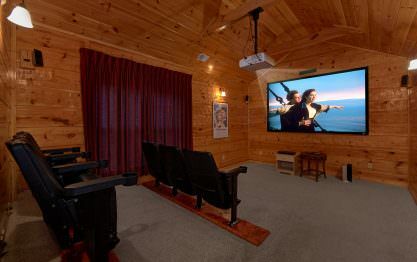 This superior interior design demonstrates the latest in cabin construction and guests can enjoy the architecture featuring exposed beams, custom timber posts and log railing. 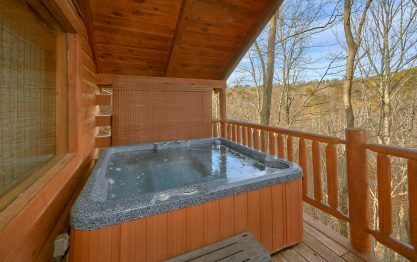 In addition outdoor fireplace, wrap around porch and top-of-the line kitchen with granite counter tops and stainless steel appliances. 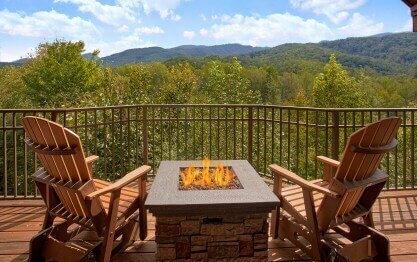 Located on the eastern side of the Great Smoky Mountains National Park near Cosby, “Live, Laugh, Love” was recently added to Elk Springs Resort rentals. 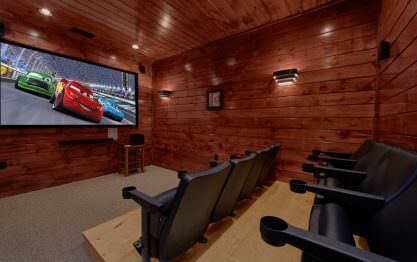 This cabin is a family favorite with its own private pool, game room, and home theatre. 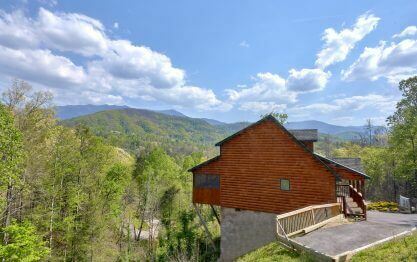 Situated closer to a more remote and less trafficked area of the Great Smoky Mountains National Park, after playing in the park guests can really take advantage of all of personal amenities this cabin has to offer. 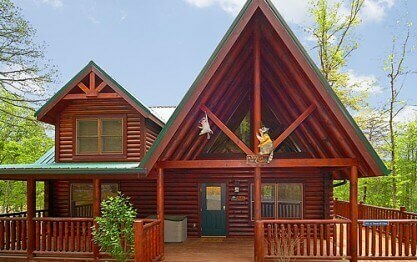 Today Elk Springs Resort boasts over 120 cabin rental sites. 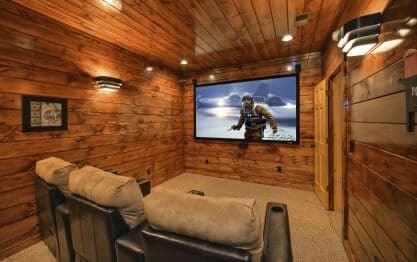 This incredible array of cabin options fulfilling its vision to create that memorable escape that places guests in the heart of pristine wildness, yet in the lap of luxury, to create memories for a lifetime. Elk Springs resort is also growing and developing their “Green Initiative.” In an effort to be more sustainable and follow “Green” building guidelines, they are incorporating more sustainable practices and techniques such as the use of solar energy and LEED (Leadership in Environmental Energy and Design) practices. Elk Springs Resort even has own water treatment system that works to recycling water to the resort in environmentally way. 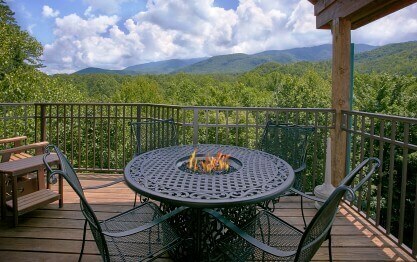 See all cabins for rent in Gatlinburg & surrounding areas.